With 20 years of innovation and professional design team. Inspired by people and technology to create quality products that make the world get better connection and make life easier. FULOXTECH strategy begins with a passion for building amazing product and a commitment to serve its customers.FULOXTECH portfolio of brands offers compelling solutions that meet the needs of today's active mobile consumers, who demand more out of the products they use. LOUD & DYNAMIC SOUND: Emitting a versatile range of sound,the Sound Bar provides a sleek and dynamic sound in stunning compact designs. It also adds a cinematic quality to your existing system as it produces deep bass by 4 powerful speakers & 2 passive radiators. 100% SATISFACTION GUARANTEE - 18 months extended warranty. Please feel free to contact us at "Support@fuloxtech.com" if you would have any questions, we appreciate that very much. 36.5-INCH 32W 2.0 CHANNEL AUDIO SOUNDBAR - Completes your home theatre system with 4 Full range high-quality speakers & 2 passive radiators that bring the bass; 4 pcs High quality inside magnetic speaker. 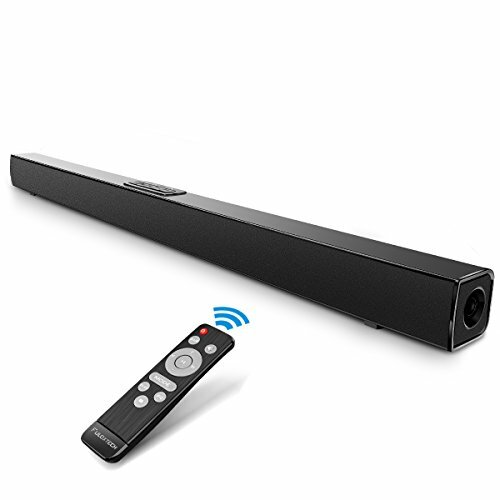 32W (4 x 8W) (High quality full frequency speaker (Treble & Alto & Bass) Whether you're watching a movie or listening to music, you can feel the best sounds from this sound bar). WIRED & WIRELESS CONNECTIONS - Modern and traditional Multi-Modes Connection; 4.2 Bluetooth Spec. : ACTions (effective distance: Up to 10meters / 33feet (Smart phone, Pad, Laptop etc); or Wired connections that include 3.5mm AUX in / RCA input / AV input (TV, CD Player, Computer etc). NOTE - The Optical Jack is Currently NOT available, and we will Update a Optical Connection ASAP. WALL MOUNTABLE AVAILABLE - Set it under the television or mount it on the wall for a convenient and elegant set up; With everything you need for a quick and easy setup, upgrading to an amazing home theater experience has never been easier-plug the Sound Bar in, connect it to your TV, sit back and enjoy. TOUCH & REMOTE CONTROL MODES - Please NOTE after you turn on the power in the back of soundbar, LED is RED light,then you should press the power button on the top or remote, then light would change into BLUE, the soundbar is in Bluetooth Mode automatically, and you can Switch the Mode depends on the connection you choose, MODE switchs by pressing the Mode button on the top or in the remote. Bluetooth is Blue, RCA is Green,and AUX is White light; to play sound properly. Material: PVC + ABS (High-Strength plastic products that reflect the best bass effect.) WHAT YOU GET - 4.2 Bluetooth Sound Bar / Remote Controller / Power Adapter / RCA Cable / AUX Cable / Wall Mountable Fittings / User Manual and 18 months extended warranty. Please feel free to contact us at Support@fuloxtech.com if you would have any questions, we appreciate that very much. If you have any questions about this product by FULOXTECH, contact us by completing and submitting the form below. If you are looking for a specif part number, please include it with your message.